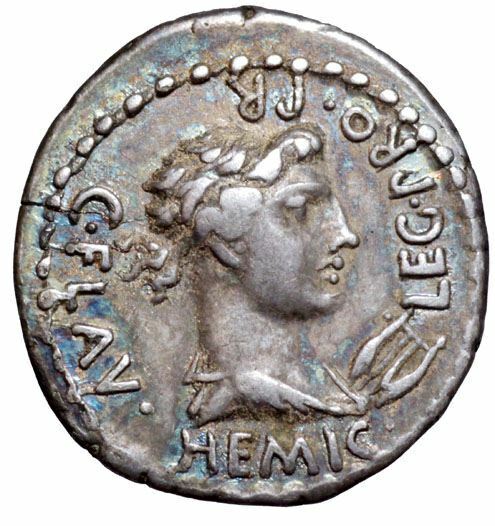 C. Flavius Hemicullus was legatus propraetor in 43-42 BC, and in that role struck coins jointly with M. Junius Brutus. Gens Flavia was a plebeian family at Rome. Its members are first mentioned during the last three centuries of the Republic. The first of the Flavii to achieve prominence was Marcus Flavius, Tribune of the plebs in 327 and 323 BC; however, no Flavius attained the consulship until Gaius Flavius Fimbria in 104 BC. The gens became illustrious during the first century AD, when the family of the Flavii Sabini claimed the imperial dignity. Under the Empire, the number of persons bearing this nomen becomes very large, perhaps due to the great number of freedmen under the Flavian dynasty of emperors. It was a common practice for freedmen to assume the nomina of their patrons, and so countless persons who obtained the Roman franchise under the Flavian emperors adopted the name Flavius, which was then handed down to their descendants.